Today, every person with an internet connection has so much power under their fingertips. As Elon Musk put it “You have more power than the president of the United States had 20 years ago“. And indeed almost everything you want to know is only a Google search away. Thousands of services like pizza ordering, productivity and weather forecasts are available in mobile apps now. This huge advancement brought a lot of value, saved us hours of useless activities that we can now spend doing what we love. And it was about time for a massive attack to come, which can use the connectivity we have between all those devices against us. 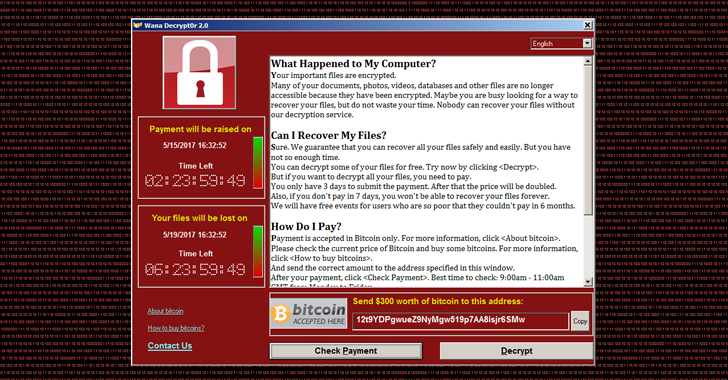 Today we are talking about the latest thing called WannaCry (also known as ‘Wana Decrypt0r,’ ‘WannaCryptor’ or ‘WCRY’). This so called worm uses a bug in Windows which allowed it to infect a machine trough the network and then spread from the new machine to another one. This is one of the most effective worms by this date as with the speed it is spreading it managed to infect more than 100 000 computers in about 24 hours. The more destructive part of this worm is that it is also a ransomware. This is means that when your computer is infected with it it silently starts to encrypt your files while your computer is working. The files are still on your machine, but they are becoming useless one by one as if they became a puzzle which was shuffled. When this process reaches a level where most of your files are now encrypted then the virus blocks your computer and shows you a message that you should pay a certain amount of money (in this case around 300 USD) with Bitcoins (so the receiver of the money cannot be traced) and in return they will (maybe) send you a key which will allow you to decrypt your files and regain access to your data. If this was your home computer you would probably have all your family pictures there and loosing them would be a huge pain. But if this is your company computer then you may be up to loosing all your company information. This can translate in lost documents, invoices, debt records… In this particular case the UK healthcare system was hit, leaving hospitals around the country unable to operate. 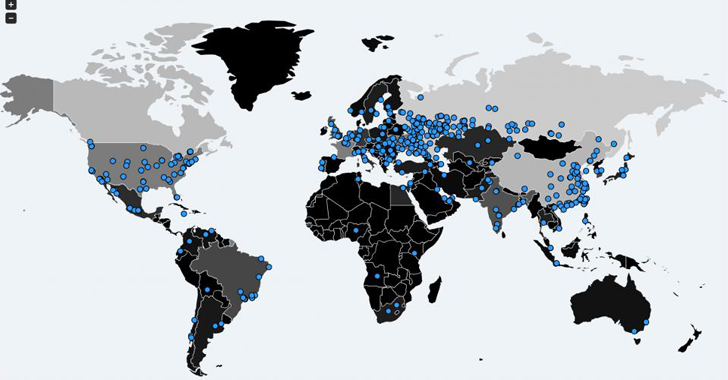 And if someone is thinking that this is a targeted attack today we can see that also the Russian railways and some banks were hit heavily by this worm. More than 100 countries are now affected. You can imagine what may be the result from the infection in these institutions. Looking at this scenario a lot of businesses are starting to panic. And this is absolutely normal, but after the panic subsides it is time to find a solution for this problem. One may be thinking of going back to paper and pen. I am sure that in some cases this will actually work. Unless you have to work with multiple branches and millions of records. Then you can quickly remember how big your team will really need to be in order to manage all that. Having in mind that this attack was targeting Windows machines some will start thinking about switching to Mac or Linux. This is also backed up by another myth that there is no such a thing like a virus on macOS (which is false). As macOS becomes increasingly popular it is just a matter of time until the hackers find a potent hole in the system which they can use to create another ransomware worm. Backing up your information regularly is always a good idea. But many people either backup their data on a local hard drive or a hard drive in their local network. This does not help a lot as if you have access to these files all the time this also means that if a ransomware worm infects your computer it can also access them and encrypt them. Cloud backup is a much better version as these services can keep past versions of your files. This means that if they get encrypted you can retrieve a past version when the file was intact and this will save the day. Unfortunately most software which handles inventory or financial data keep that information is a database. Databases also store all data in files, but this is not a file which you normally backup to the cloud as it is useless by itself and just coping it will not always work unless you have all the accompanying files with it in exactly the same version. Hybrid cloud solutions like IncoCloud are some of the best when it comes to business data. They have the best speed when you work normally as the information is stored locally and you have fast and reliable access to it with or without internet. This speed is provided by a local database. They also backup all that information securely to the cloud immediately when there is internet access to a remote server which handles just that. In case something happens to your system and the files get corrupted or encrypted all your information will be safely stored on another machine. Downloading it from the server will take just a few minutes. And you will be good to go without any lost information. Try IncoPOS now and try our free cloud backup to IncoCloud. Don’t wait until it is too late.